There are generally two types of campsites: dispersed and campground. One is free is sparse with amenities and the other hooks up it, often literally (electric). They range from $0 (off-season sometimes) to the mid-$20’s. They normally provide at least a table (with seating), fire pit (with grate or separate charcoal grill) and tent pad (place to put tent). Some are basic, some have electric, and some are full hookups for RVs. They always have restrooms and sometimes showers, laundry and a playground for the kids. Both options can be found across the state. The following guide aims to point out what’s available in different regions of Colorado. There are many campsites not on here. Tip – It’s always good to show up early and claim your spot, or reserve well in advance for popular spots like state and national parks. It’s free and mostly found in national forests and B.L.M. lands. These federally owned public lands are open to the public year round. Usually unless otherwise noted, camping is permitted, however, it’s preferred you use existing campsites. There are more than enough of these to go around, if you know where to look. These primitive sites are generally marked by a fire ring and don’t provide amenities, like restrooms or tables. If you’re lucky there will be a vault toilet at a nearby trailhead. Most sites are located next to the road for easy car camping. 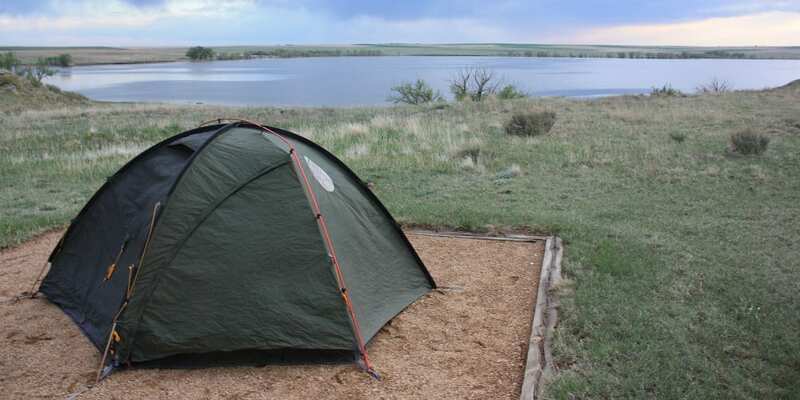 READ: Free camping in Colorado for tips on how to find dispersed camping on your own. It shows you where to look, how to know if its okay and Motor Vehicle Use Maps, which often mark roads where its permitted. Otherwise read on below for specific dispersed campsites below. Mt. Evans – Drive up to over 14,000 on this byway. Dispersed camping – can be found on Hefferman Gulch Rd and West Chicago Creek Rd, both located north on CO 103 toward Idaho Springs. Each has about a half dozen or so spots. Guanella Pass – Another scenic byway with ample camping, connects Georgetown with Grant. Take Guanella Pass Rd from downtown Georgetown. Dispersed camping is easy to find just out of Georgetown and Grant, on the byway. Lake Dillon – A large reservoir between Dillon and Frisco, at 9,000 feet. Green Mountain Reservoir (shown) – A beautiful and often overlooked reservoir on US 9 between Silverthorne and Kremmling. Dispersed camping can be found in the White River National Forest, west of the lake. From the north end of the reservoir, go about 3 miles north on US 9 to Spring Creek Rd. Take a left and follow for 7 miles or so until you reach the national forest and camping is allowed. Sylvan Lake State Park – This state park is tucked away in the woods, 11 miles south of Eagle. Dispersed camping is available south of the lake on Brush Creek Rd. Follow past lake to a fork in the road with Powerline Rd. Either road has some camping along it. Red Cliff – A tiny mountain town just pass Minturn on US 24 from Vail to Leadville. There’s numerous camping options in the surrounding White River N.F. Dispersed camping can be found on Notch Mountain Road, between Minturn and Red Cliff on Hwy 24. It can also be found on Homestake Rd near Gold Park Campground and Yoder Gulch Rd, both past Hornsilver on Hwy 24. Twin Lakes – Mount Elbert hovers behind these magnificent lakes. Twin Lakes is located at the start of Independence Pass, a summer short cut to Aspen. Dispersed camping – Look for sites on forest service roads off CO-82 in Twin Lakes. There are also many primitive sites ten miles south on Hwy 24 at Clear Creek Reservoir. Cottonwood Pass – The pass connects Buena Vista with Almont on the other side of the Divide. Dispersed camping can be found near Buena Vista. 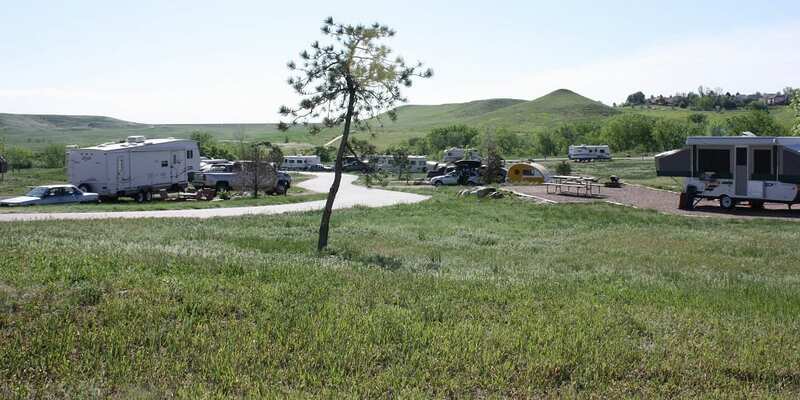 There is 1 campground near Buena Vista and the rest are near Taylor Park Reservoir on the west side. Take Co Rd 306 west out of town. Dispersed camping can be found minutes out of Buena Vista on CR 306 (the pass). There are several creek-side spots, and plenty of camping on the other side of the pass too. Clear Creek Reservoir – Intersection of Hwy 24 and County Rd 390 (b/w Leadville and BV). The lake and campground are located at the start of the drive, and then it’s dispsersed camping with a few ghost towns. Dispersed camping is the draw here. 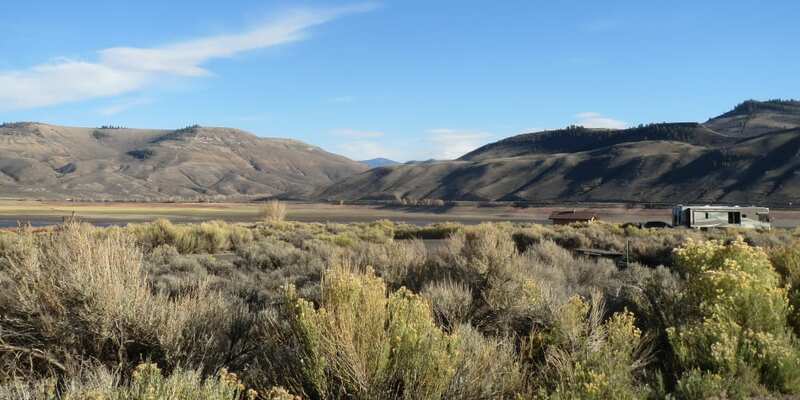 There is a bit of private property at first, but then a few miles back there are loads of spots nearly the rest of the way to Winfield (a cool ghost town – 12 miles back). Chalk Creek Canyon – Numerous attractions, like Mt Princeton Hot Springs, Agnes Veil Falls, and St. Elmo Ghost Town lie in this canyon. All 3 campgrounds are next to each other, about 10 miles down Chalk Creek Rd. Take 285 south of BV for 8 miles to Nathrop, and take Co Rd 162/Chalk Creek Rd. There is no dispersed camping in Chalk Creek Canyon. Arkansas Headwaters State Park – The Arkansas River journeys 150 miles from Leadville to Cañon City. The state park has lots of river access sites on the whole way. 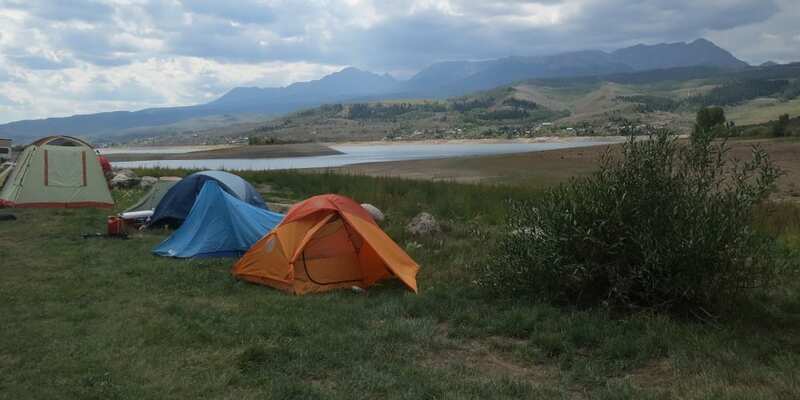 Dispersed camping is available at many spots between Leadville and Cañon City: Twin Lakes, Clear Creek Res, Cottonwood Pass, and other sites in the San Isabel N.F. Monarch Pass – The main route from Salida to Gunnison, Highway 50, takes you up Monarch Pass over the Continental Divide. Dispersed camping is available on some of the dirt roads on either side of the pass. My choice would be Old Monarch Pass, which is another route over the Divide. It’s about half way up Monarch Pass on the Salida side, before you a make a right. Campsites are easy to find on this 2WD-friendly road. Roosevelt National Forest – Take Colorado 119 west to Nederland to begin exploring this mountain wonderland. Dispersed camping can be found near Eldora Resort. From the resort and Eldora Rd, take Forest Service Rd 505. It goes to Caribou, an old ghost town. There’s additional camping just southwest of Kelly Dahl. From campground, go south on 119 for 8 miles to Rollinsville. Make a right on Co Rd 16 and follow for a mile to East Portal Rd. There is some camping available on this road. 4×4 is best for exploring these forest service roads, and a map – Roosevelt Boulder District (PDF). Cherry Creek State Park – Denver’s backyard playground, located near intersection of I-25 and 225. Chatfield State Park – A large reservoir in the foothills southwest of Denver. Bear Creek Lake Park – A Lakewood city park, centered around 3 distinct lakes near Red Rocks. Biking, fishing, swimming and water skiing are common. 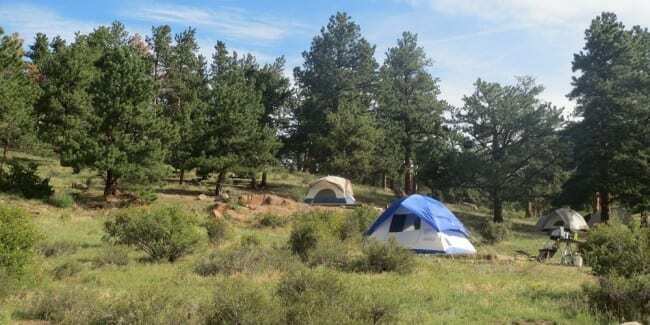 Golden Gate Canyon State Park – Great camping and hiking in the beautiful Front Range. Dispersed camping can be found near Pickle Gulch Campground. Take CO 46 west from the park for nearly 7 miles, before making a right on Missouri Gulch Rd. Follow that to campgrond. Forest Service Rd 718, next to the campground, permits camping. Deckers – A good hour west of Castle Rock in the Pike National Forest. South Platte River runs through this small community, creating world class trout fishing. Dirt biking in the area is also popular. Campgrounds are scattered throughout the woods. Jackson Lake State Park – A 2700 acre reservoir with boating and fishing. Prewitt Reservoir SWA – A beautiful lake-centered state wildlife area. No campgrounds, but dispersed camping is permitted around the lake with valid hunting or fishing license. Pawnee National Grassland – One of the few places to see Colorado’s natural prairie landscape. It’s east of Fort Collins and like most of the plains, it gets windy. North Sterling Lake State Park – A large state park home to a 3,000 acre reservoir. Dispersed camping – permitted in many of the roads, with the biggest concentration of sites near the Pawnee Buttes. Comanche National Grassland – A 2nd national grassland in the Southeast near La Junta. Dispersed camping is permitted in most parts of the grassland. Try around the Picket Wire Corrals Interpretive Site. Take Hwy 109 south from LaJunta for 13 miles, turn west on CR 802/David Canyon Rd, and go for 8 miles. Turn left (south) on CR 25 and go for 6 miles to reach the site. John Martin Reservoir State Park – The go-to place for water recreation in the Southeast. Rocky Mountain National Park – One of Colorado’s most popular attractions, with 5 campgrounds and 1 group campground. A national scenic byway, Trail Ridge Road, connects Estes Park (east) and Grand Lake (west), peaking at 12,183 feet. Longs Peak is visible from most of the park. Horsetooth Reservoir – A beautiful reservoir in the foothills west of Fort Collins. At it’s fullest, it’s 6.5 miles long. The Inlet Bay Marina rents boats. To the west of the lake is Lory State Park, a great place to hike or bike. Cache La Poudre-North Park Scenic Byway – Camping can be found the whole way from Fort Collins to Walden. Dispersed camping is available but not directly on the byway. Check out this Roosevelt Ranger District PDF map – Canyon Lakes North to identify more dispersed camping (see legend). Boyd Lake State Park – Motorized boating south of FC in Loveland. Saint Vrain State Park – Year round state park located south of Fort Collins near Longmont. State Forest State Park – A rugged and remote state park, 19 miles southeast of Walden on Hwy 14. It’s the largest state park, with 71,000 acres and 1/3 of North Park’s moose population. ATV’s and other OHV’s have more than 50 miles of 4×4 roads to play on. Campgrounds – 4 campgrounds, dispersed camping sites (for a fee) and backcountry camping, Reservations. Dispersed camping can be found just south of State Forest State Park in the Roosevelt N.F. There are lots of free sites, minutes from the deserted town of Gould. Take CR 21 a mile or so back, from town, to the national forest. Vasquez Ridge – A great place for free camping, hiking, biking, OHV in Winter Park. Dispersed camping is all that’s available back at Vasquez Ridge. It’s everywhere once you reach the Arapaho N.F. Saint Louis Creek – Another place for hiking, biking, OHV riding in Fraser. Dispersed camping – There are some sites but not as many as neighbor Vasquez Ridge. Great Lakes of Colorado – Six great lakes, with the highlight Lake Granby. Dispersed camping can be found near the south end of the Shadow Mountain Lake. Take County Road 4 (right after Grand Lake Tap House) a miles back to the Stillwater Pass area where sites are evident. Williams Fork Reservoir – Large lake only 8 miles south of Hot Sulphur Springs. Take US 40 west 4.6 miles to CR 3. Follow that to Co Rd 341 and then take that west to the lake. Dispersed camping can be found on County Rd 340 near the lake. Instead of taking CR 341 west to the lake, take CR 340 southeast to the Arapaho National Forest. Within a few miles there will be campsites. Wolford Mountain Reservoir – A lake 8 miles northwest of town on Hwy 40. Fishing and boating are common. Radium – A primitive hot springs on the banks of the Colorado River. It’s about a 20 minute hike to the springs, and camping is found at the parking lot and trailhead. There are several free dispersed camping sites at the parking area. Take Hwy 9 south for 2 miles to Trough Springs Rd/CR 1. Follow for 13 miles to Co Rd 11, and a sign for Radium. Make a right and follow for a mile or so to parking. Rabbit Ears Pass – This high mountain pass runs for miles on Highway 40, 20 minutes east of Steamboat. There are a number of scenic hiking and OHV trails, and fishing in Dumont Lake. Dispersed camping – is easy to find on the forest service roads off the highway. Buffalo Pass – Free camping minutes from downtown Steamboat and hot springs. Dispersed camping is available very shortly after the Dry Lake Campground, directly on the pass. Stagecoach State Park – A large reservoir south of town in Oak Creek. Pearl Lake State Park – Quiet and wakeless compared to nearby Steamboat Lake. Steamboat Lake State Park – A popular escape for water sports in the Northwest. Hahns Peak Lake – Managed by the Routt N.F., this hidden lake is just north of Steamboat Lake. Dispersed camping can be found in the surrounding Routt National Forest. Both Forest Service Rd 486 and 488 near the lake have spots. Flat Tops Trail – A national scenic byway connecting Yampa and Meeker. Dispersed camping is everywhere once you get going on the byway. Most dirt roads will yield a few campsites, with plenty right on the byway. The only exception is the Trappers Lake area. Yampa River State Park – 3 sections of state park along a 134-mile stretch of Yampa River, from Hayden to Dinosaur. The headquarters is in Hayden, just west of Steamboat on Hwy 40, and features a large campground and river access. There are also 6 paid primitive camping areas along the 134 mile stretch of river. Each campground has 5-10 sites. And Elkhead Reservoir, located 11 miles west of Hayden, has camping. Dinosaur National Monument – The dinosaur fossils are on the Utah side near Vernal, and the Colorado portion consists of a scenic auto tour (Harpers Corner Rd) to an overlook of the Yampa and Green Rivers. The biggest and easiest-to-access campground is Green River near the Utah Visitor Center. There’s also some camping southeast of Dinosaur in Rangely, CO. Dinosaur itself is a tiny town with a place or 2 to eat, and a gas station. Rangely – The largest CO town around Dinosaur, 18 miles southeast on Hwy 64. Rangely has a rich oil mining history, and the largest oil field in the Rockies is near town. There are several places to eat and shop in town. Cheyenne Mountain State Park – A beautiful state park at the base of Cheyenne Mountain, just south of the city. The walk-in tent sites are very nice, and add a bit of privacy. Mueller State Park – This gorgeous state park, just west of Colorado Springs, has 19 miles of multi-use trails and 55 miles total of hiking trails. The campgrounds are laid out in an alpine forest. It’s a convenient place to camp too, with Florissant Fossil Beds National Monument to the west and Cripple Creek to the south. Divide is the closest town, 5 miles north on Hwy 67. Eleven Mile State Park – An 11 mile long lake, open to motor boats, sailboats, canoes, but no water/body contact sports like jet skiing skiing or swimming. All campsites are within walking distance to the lake. Boat rentals are available at the lake and also next door at Spinney Mountain Reservoir, another state park open for day use. Royal Gorge – This natural landmark is impressive, and so is the bridge across it. The Arkansas River created this canyon which is famous for its whitewater rafting and narrow gauge train. The park also features same amusement rides, like a Royal Rush Skycoaster and Soaring Eagle Zipline. 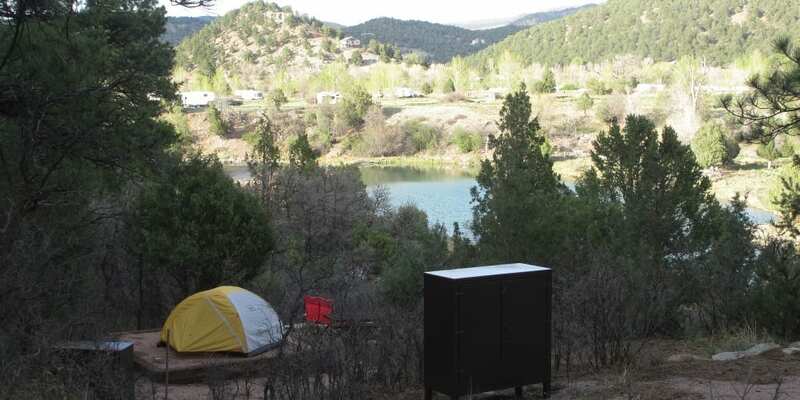 There are a half dozen primitive campsites at the park, and a lot of private run campgrounds in the Cañon City area. Campgrounds – 6 primitive sites, on the property near the Gorge. After entering the park, the sites are off one of the first dirt roads to the left. non-reservable. See Arkansas Headwaters SP, further up this post, for several campgrounds on Hwy 50 west to Salida. Lake Pueblo State Park – The Arkansas River flows into Lake Pueblo just west of the city. This 10,000-acre park makes a great base for exploring South-Central Colorado, including the Pueblo Zoo and Cañon City. Boat rentals are available at the 2 marinas. 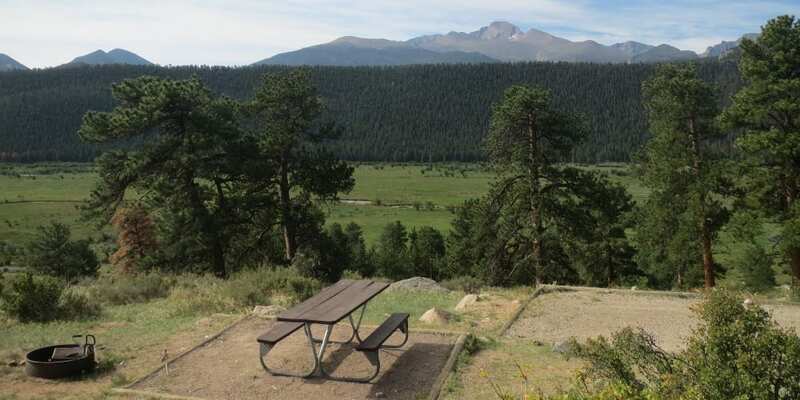 Pueblo Mountain Park – 25 miles southwest of Pueblo on Hwy 78, lies this 611-acre mountain park. Lake Isabel provides fishing opportunities. Great Sand Dunes – The 150,000 acre national park is open year round for exploring this unique natural wonder. 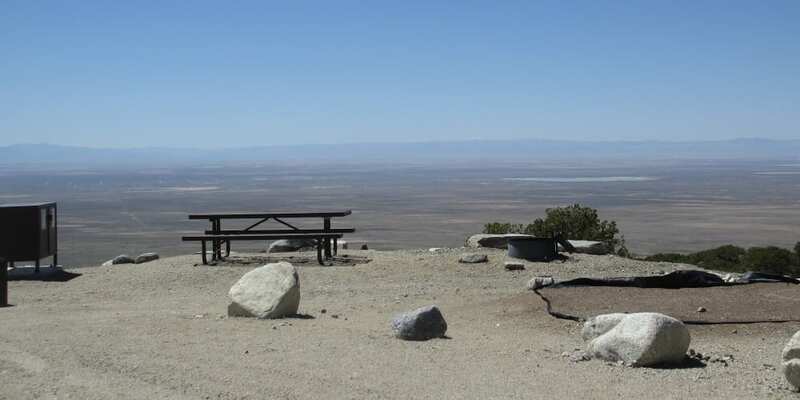 The Pinyon Flats Campground is within walking distance to the Sand Dunes. Zepata Falls (shown) – A cool little waterfall and campground located a few miles south of the Sand Dunes. The road up to Zepata Falls is a bit rough, but most 2WD cars with good clearnce should be fine. San Luis State Park – Centered around the 890-acre San Luis Lake, this is a wonderful state park to stay at if visiting the Sand Dunes. Campsites overlook the Dunes, and there’s fishing and boating the lake. Lathrop State Park – Nearly 1600 acres make up this scenic state park, south of Pueblo on I-25. There are 2 lakes, Martin Lake and Horseshoe Lake. The first is open to power boats, jet skis, and water skiing, and the latter permits only wakeless boating. Trinidad Lake State Park – A 2700-acre state park, and water sports haven in southern Colorado. Trinidad Lake permits boating through November, with jet and water skiing allowed. Silver Tread Scenic Byway – A fantastic drive through the remote Rockies. This byway passes by waterfalls, lakes, mines and wilderness, on it’s way from Hwy 50 to Hwy 160. Dispersed camping can be found in much of the national forest land around the byway. Just look for dirt roads and access signs. There are spots near Trappers Lake, the Alpine Loop and a ton around Creede. Ridgway State Park – A large state park centered around the 5 mile long, Ridgway Reservoir. Ridgway has some of the best camping out of any state park, mostly due to it’s scenic location at the edge of the San Juan Mountains. There are over 200 modern lakeside sites, and 25 walk-in sites on a forest hillside. National Forests – Campgrounds and dispersed camping can be found in the national forests around Ouray. Telluride Town Park – Like its name implies, it’s a park at the end of town. 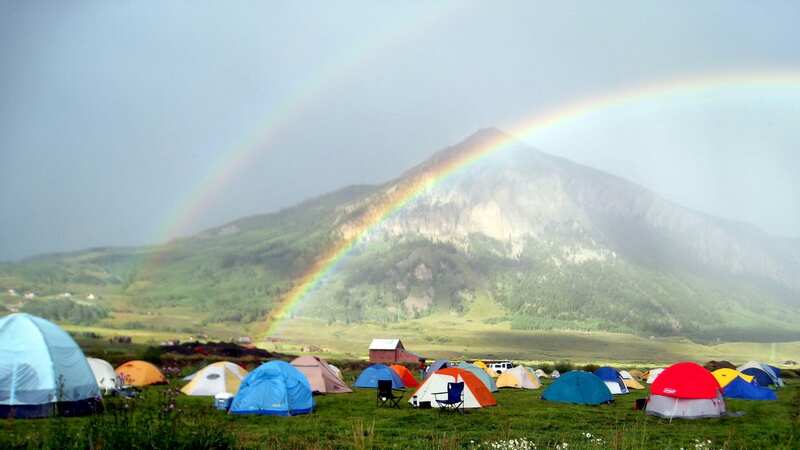 It’s commonly used as setting for Telluride’s many festivals, and happens to have a campground. National Forests – Telluride is surrounded by national forest land. There are numerous opportunities along the San Juan Skyway, which is a scenic byway (Hwy 145) around Southwest Colorado. Mesa Verde National Park – World famous for its Cliff Dwellings, Mesa Verde is a must visit attraction in the Southwest. Take a guided tour and explore the Ancient Anasazi villages. Mancos State Park – A secluded state park, centered around Mancos Lake. It’s a great place to base when visiting the Southwest, including Mesa Verde and Durango. The picturesque, 217-acre lake is open to fishing and wakeless boating, with rentals available. Hovenweep National Monument – Step back in town at another Ancient Puebloan archaeological site. The campground has a gorgeous view of Sleeping Ute Mountain. Part of this monument is in Utah and part is in Colorado. Many of the Colorado ruins are located around ruins from the Canyons of the Ancients National Monument. Dispersed camping can be found on many of the dirt roads near the Canyons Of The Ancients ruins in Colorado. The land is managed by the BLM and permits camping as long as its more than 300 feet or so from ruins. McPhee Reservoir – A large reservoir located north of Cortez in Dolores. It’s named after an old company town, McPhee, that’s now submerged under the lake. San Juan National Forest – Durango is surrounded by the remote San Juan National Forest. 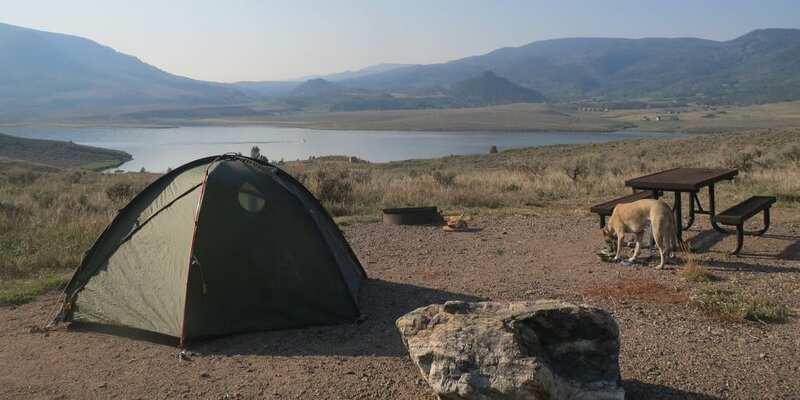 Campgrounds listed below are in three main sections: one is by downtown, two are north near Haviland Lake, and three are west toward Mancos. Vallecito Lake, below, is also in the San Juan N.F. Vallecito Lake – In the San Juan National Forest, 20 miles northwest of town. The lake is surrounded by camping and recreation. Navajo State Park – This southwestern treasure holds the gigantic, 25-mile long Navajo Lake. It stretches south into New Mexico and features 15,000 surface acres of water. The park is located southeast of Durango. It’s about the same distance southwest of Pagosa Springs. William Creek Reservoir – A 25 mile jounrey frmo downtown. Drive west to Piedra Rd and follow north to lake. Dispersed camping can be found on the way to Williams Creek Reservoir on Piedra Rd. Some of the closest dispersed sites are on Turkey Springs Rd, just north of Hatcher Reservoir. Wolf Creek Pass – East of town on Hwy 160. West Pagosa Springs – West of town on Hwy 160 toward Durango. McClure CG – on Hwy 133 near historic Marble (past Redstone) and Lee Creek, non-reservable. Dispersed camping can be found just south from Redstone Campground. Going south on 133, take a right on Coal Creek Rd in Redstone. Camping is permitted on parts of this road. There is more camping west of Marble near Crystal in the White River N.F. Maroon Bells – Two twin peaks and the beautiful Maroon Lake – minutes from downtown Aspen. Take CO 82 north of downtown to the circle and take Maroon Creek Rd back. Another road accessible from the circle, Castle Creek Rd, leads 12 miles back to Ashcroft, a cool ghost town. While there is no dispersed camping at Maroon Bells, there is some close to Aspen. From the circle, before Maroon Creek Rd, take CO 82 north for 7 miles to Woody Creek. Take a right on Woody Creek Rd. and follow 8 miles back to Lenado, a ghost town. Primitive sites can be found further on this road. Ruedi Reservoir – Lake with four campgrounds located 14 miles east of Basalt on Frying Pan Road near Aspen. Kebler Pass – County Road 12, a seasonal, 31 mile drive from Crested Butte to Hwy 133 near Paonia State Park. Lost Lake CG – Lost Lake Slough. Go 15.9 miles from CB to CR 706, turn left and go 2.4 miles. Gothic CG – not on the pass, but close to CB. Go 4.5 miles north from the mountain resort on Gothic Rd. 4 sites, basic, non-reservable. Dispersed camping can be found directly on portions of the pass. Just go west on CR 12 from downtown CB. There’s additional free camping east of CB too. Go 2.4 miles south of town on Hwy 135, and make a left on Co Rd 738. Follow that back for 3.5 miles to the N.F. where camping is permitted. See Gunnison-North Map. Almont – A tiny town just north of Gunnison toward CB. Taylor Park Reservoir lies to the northeast of town. Campgrounds – There are over a dozen campgrounds northwest of town. See “Cottonwood Pass“, near the top of this post under Buena Vista, for reservable spots near Taylor Park Reservoir. Dispersed camping can be found just west of Almont Campground on Forest Service Rd 860. Or go east from Almont on CR 743 for a few minutes to camping. Or take CR 742 from town for about 20 miles to the Taylor Park Reservoir, where there’s lots of dispersed camping in the area. Also see Cottonwood Pass, under Buena Vista for campsites on west side. Pitkin – A semi ghost town, with a general store and lots of historic buildings. Pitkin is surrounded by the Gunnison National Forest, east of Gunnison. Area activities include ghost towns (Tincup, Hancock, Ohio City), and 4×4 roads, like Tincup Pass over to St Elmo. Take US 285 east of Gunnison for 11 miles, and make a left on Co Rd 76. Follow that 16 miles to town. Tincup, Taylor Park Reservoir and Cottonwood Pass are to the north of Pitkin. Dispersed camping is very easy to find around town. Take Waunita Pass from the south end of town. It’s a short pass that’s fine for most 2WD cars. There’s great camping at the top of the pass. Or camp along Co Rd 765 toward Tincup, a ghost town with 1 season restaurant, Frency’s Cafe. It’s all over the place. Blue Mesa Reservoir – Part of the Curecanti National Recreation Area and the largest body of water entirely in Colorado. There is some dispersed camping west of Blue Mesa, near the Morrow Point Reservoir (also part of Curecanti). Continue on CO 92 after the Blue Mesa Reservoir (not Hwy 50) heading towards Crawford. Go for 8.3 miles after the fork (50/92) and make a right on County Road 720. Camping is permitted once you hit the Gunnison N.F. in a few minutes. Another option is to drive 18.9 miles from the intersection (50/92) to Forest Service Rd 719. This accesses the n.f. in a couple minutes where camping is all over. Rifle Gap State Park – A picturesque state park located just northeast of Rifle. Rifle Gap Reservoir welcomes boats, jet skis, water skis, from April through October. The fishing is great too. Rifle Falls State Park – This stunning waterfall is just up the road from Rifle Gap. Rifle Falls is a small, forested state park, with creek-side campgrounds. There is fishing here to in some ponds and at the Rifel Falls State Hatchery, a 1 mile hike from the falls. Colorado National Monument – A stunning national monument in Grand Junction’s back yard. The 23-mile Rim Rock Drive connects Grand Junction and Fruita, and passes by the park’s many towering monoliths. Colorado River State Park – There are 5 sections of this convenient state park located on the Colorado River. Camping is available in 2 of the sections. Highline Lake State Park – An oasis in western Colorado’s high desert. Highline Lake permits boating, jet skiing, water skiing, and Mack Mesa Lake is open to hand/electric powered boats. Vega State Park – A breathtaking park secluded an hour east of Grand Junction, near Grand Mesa. Black Canyon of the Gunnison NP – A mesmerizing canyon on Colorado’s Western Slope. The Black Canyon has a South Rim, near Montrose, and a North Rim, near Crawford. They are not connected by a bridge, so it’s about an hour and a half to reach the opposite rim. There are more campsites at the South Rim, but the tent camping on the North Rim can’t be beat. Artificial lure/fly-fishing can can be accessed from the South Rim, with a road down to the Gunnison River at the bottom of the canyon. Crawford State Park – A remote state park near the North Rim of the Black Canyon of the Gunnison. Paonia State Park – A quiet state park, nestled in a canyon 45 miles east of Delta. Reservation links on here are affiliates through Reserve America. READ: 20 Car Camping Essentials for an equipment checklist. Do you have any favorite campsites you care to share? Please comment below. Very cool. Excited to knock these out! Awesome organized list.